Whether you want a permanent place to cook outdoors, or you just want a temporary structure to grill for a season, making the choice to build a brick bar-b-que is a smart decision. Professional bricklayers could potentially build elaborate brick bar-b-que structures that have storage compartments, doors and vents with hinges and many other features that require some intricate masonry work and brick cutting. However, as a do-it-yourself homeowner you may want the luxury of a well-built outdoor grill without the hassle of complicated brick laying. It is possible to build a brick bar-b-que with or without mortar and in a way that requires minimal effort. Concrete - Choose concrete mix that you can combine with water in a wheelbarrow - buy enough for a 4 foot by 4 foot pad that's about 3 feet deep. Grates - Buy two grates of the same large size for both your cooking area and for charcoals. The design of your grill will be centered on the size of these grates. Bricks - Once you have the grates, draw out the design of your bar-b-que based on firebricks that measure about 2.25 inches by 4 inches by 9 inches. The cooking surface of the grill should be about 30 inches high, with a flat surface on each side that can range from 16 to 34 inches, depending on how large you want the structure and how many bricks you're willing to buy. Depending on your brick-laying skill, if you're using mortar and want to incorporate a door to control the fire, make sure to find the doors before you start building so you can incorporate the right size into your design. 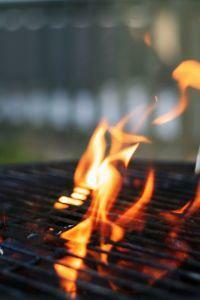 Building your bar-b-que may take a great deal of time and patience, but it is certainly possible for anyone to do. Many people consider brick-laying as a form of art, so the design is completely up to you. Just be sure that if you're dry stacking the bricks (without mortar), that you do so in a U-shaped fashion with two layers of bricks at the base, two large towers and a back wall. If you use mortar, you can get more creative with your design. Before you start laying your bricks, you'll need a level surface. To accomplish this, dig a hole about 4 feet and 1/2 inch square and 1 foot deep into the ground. Using wooden planks, cut sheets of wood 4 feet square and 3 feet high and nail them into a box structure along the edge of your hole. This will be your concrete "form." Mix concrete with water in a wheelbarrow, and pour the concrete into the form until it's filled about halfway to the top. Lay down rebar in parallel about 6 inches apart, and then continue pouring cement up to the top of the form. Using a long stick and a level, scrape the surface of the wet concrete until it's completely smooth and level in all directions. Allow the concrete pad 48 hours to set. If you're planning to dry stack the fire bricks, then most of the work is done. Simply lay down two rows of brick on top of your concrete base, and then begin forming your U-shaped cooking structure as you work up one row at a time. The fire chamber should be designed at almost the exact width and depth of the grates that you purchased. At the level you want to have the charcoal grate, push the side bricks slightly outward into the fire chamber. The grate will lay on top of these protruding bricks. Do the same for your cooking grate about 10 inches above the charcoal grate and 30 inches above the base. Once you've stacked the charcoal to the cooking surface, you're done! Laying bricks is a lot like dry stacking, except you'll lay down a half-inch "bed" of mortar between each row of bricks as well as between them. Whenever you lay another brick into the bed of mortar and press it firmly, remember to scrape away excess mortar with your trowel. You can build the same simple structure with mortar as when you dry stack, or you can try other designs, such as starting with a very wide base for your fire and cooking area, but continuing above the cooking surface to build a "chimney" that redirects the smoke. You can also install hinge bars between bricks in order to install a door or a vent to control the fire easier. The most difficult part of building your own brick bar-b-que isn't really the process of building it - it's deciding on which design you want to use.